Chicago woodworker Alex Brown handcrafts these wood and brass Qi wireless chargers from start to finish. A high tech phone accessory is the last thing you'd expect to look like a detail from the grand entrance of a fancy 1930s office building. But simply set your phone on Alex Brown's objet d'art and watch the battery fill up. 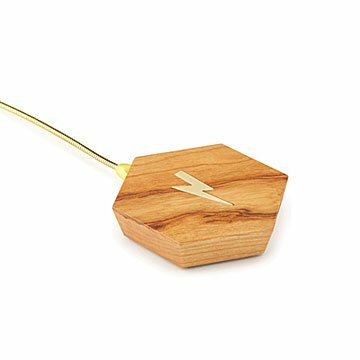 After hand selecting cherry wood from a lumber mill a block from his Chicago workshop, Alex cuts it to highlight the most interesting grain variations, then decorates each hexagonal piece with an inlaid brass lightning bolt. After carefully installing the electronic wiring, he cuts and glues green felt on the bottom, creating a beautiful blend of digital technology and old-fashioned craftsmanship. Handmade in Chicago. Anyone who knows Alex Brown will tell you he's an easy man to find. He splits his time between his Chicago workshop, where he can usually be found tinkering away, or cooking at home, where he lives with his wife and their permanent puppy, Posie. Alex is inspired by the delicate interlacing of natural materials and technology. His wireless chargers show that, when woven together, these two seemingly opposite mediums join beautifully to create a functional artistic piece. Wash with damp cloth, wipe dry immediately. I bought this for my husband for Christmas 2018. It is now February 18th 2019 and the product circuit board shorted out and caught fire. He used it like the average person would for the last two months, only charging his phone on it during the night when he slept. No usage out of the ordinary. I'm concerned about the product's short life span and its ability to combust like it did. I'm glad I was awake tonight to smell the burning and prevent any possible damage to my home and the lives within my home. Great Useful Gift...and Stylish Too! Love the use of wood to make a everyday item cool and unique! as soon as i saw this i ordered it immediately.it is so cool. My father loved this gift. I wanted him to enter the wireless charging era but needed something my mother would be ok looking at! My husband was extremely excited and I was too because it's hard to get a gift for the guy who has everything. He is totally into technology and this gift would have been perfect EXCEPT, it does not work. It plugs in and shows that it has power but sadly does not charge . . . ANYTHING. We are all pretty bummed and disappointed. Total waste of money. ðŸ˜” I'm not sure how to RETURN!! !